What is it about this blue with this yellow?! This weekend I did a little sewing. Something I had been meaning to make up for ages and ages... a cosy sleeve for my laptop. I do occasionally get out of the house, and when I need to take my laptop with me, it always feels rather vulnerable knocking about in any old bag. So, I made a sleeve for it, and a little bag for the the cables and mouse, which just happens to be perfect for keeping the sleeve in when not being used. I had always wanted to use Anna Mara Horners Coreopsis Lime for this sleeve, and was planning to use some Klona cotton. However, we've just received the first delivery of the new range of Linen / Cotton blends into the shop. So I used some of this instead and the weight and texture is perfect. I went with the Pool Blue linen which on reflection I'm not sure about. I think I would have been happier with either the Turquoise or Charcoal, but unfortunately those colours are coming in next week. There is something about this blue and yellow together that I don't like. It reminds me of something institutional, although I can't quite put my finger on it... hospital curtains maybe! Anyhow, it was lovely to use the new linens... I think I'm going to be using these a whole lot more, and at least my laptop can stay safe on those trips now. 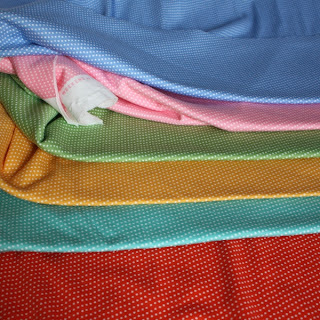 I'll be talking more about the linens soon. Including introducing a selection of fab bundles, so watch this space. I can't quite believe that these beautiful bolts have been on my shelves for nearly a week and I've not yet told you about it on the blog. What on earth have I been doing?!! So, may I introduce you to Alegria. 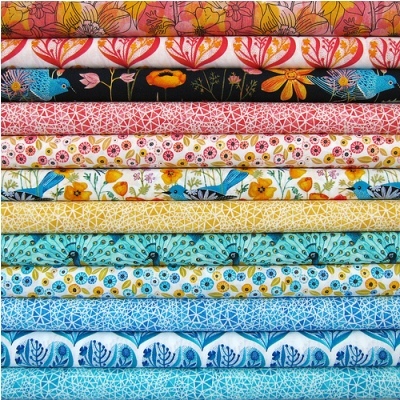 This is the latest collection from the wonderful Cloud 9 Fabrics who just keep bringing out more and more exciting ranges. And this one, I think you will agree is a complete stunner. Twelve organic prints of flowers and birds in vibrant colours. Don't they look lovely? Well they look even better in the flesh, and the quality of the fabric is awesome, it has a really silky feel. We have a fat quarter bundle on the 'Packs and Kits' page and metres off the bolt under 'Patterned Fabric'. You'll be glad you splashed out on this one! Hooray! 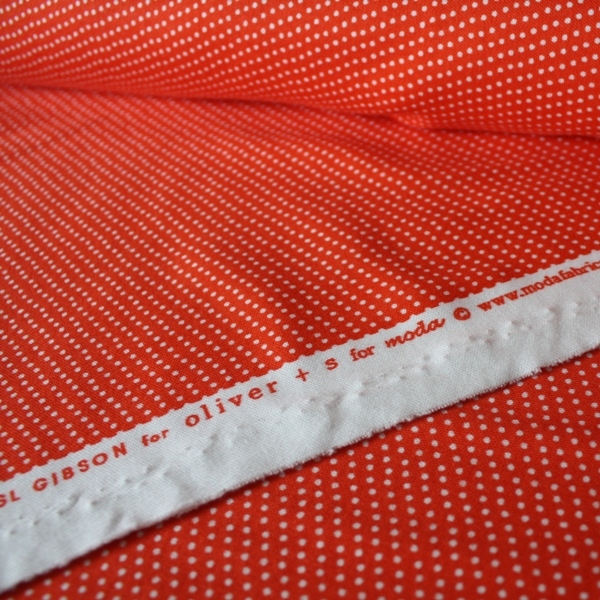 Oliver+S have just released their spring/summer children's clothing patterns and we have them in the shop. Watch out, these are really cute. First off, we have this fantastic Secret Agent Trench Coat. 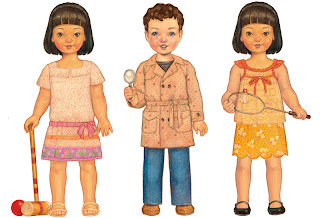 This is such a brilliant idea, practical and stylish, the trench can be made in the tradition style with will suit boys and girls, or for your girls you can make the dropped-waist version that has a little skirt. Then, we have the Croquet Dress which is a hugely versatile dress. 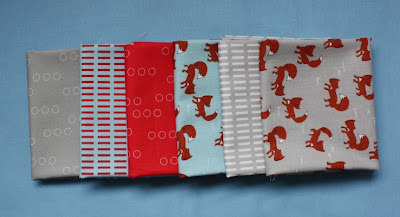 You can make plain versions and fancy versions with plenty of opportunities for contrast fabrics and fancy trims. It has short sleeves and a dropped waist, gathered simply with elastic. 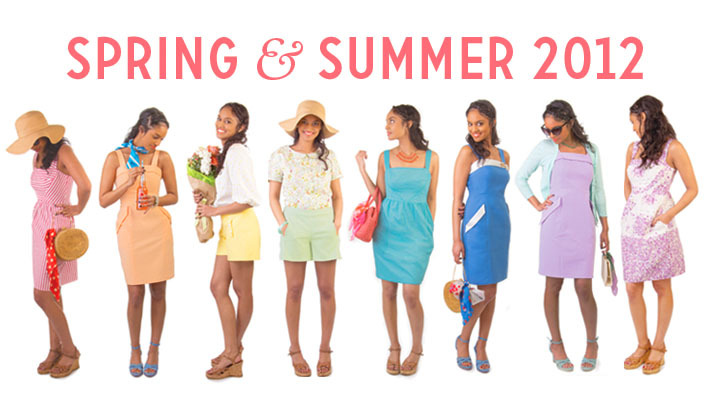 This is a dress for every day and for those special occasions. Finally, we have a the Badminton Skort, Top and Dress. This is the super sneaky style, which has hidden shorts underneath the skirt, which means cartwheels without showing the whole park your knickers! The skirt also has a, bang on trend, scalloped hem. The matching top is a perfect summer vest with pretty ruffles at the shoulder. A fantastic trio of patterns I'm sure you will agree. In this shipment we were able to restock on our most popular styles such as the Family Reunion Dress. 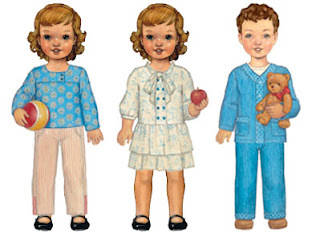 And, don't forget, we are having a clear out in the Oliver+S patterns. A huge selection of the older styles are on sale at 20% off. We will not be getting these back in, and many are already out of print, so get them whilst you can. Great excitement! 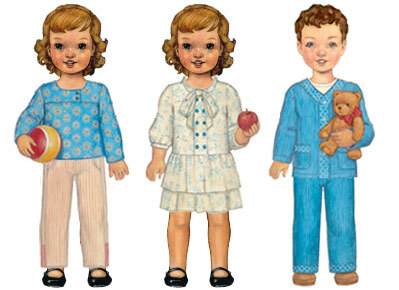 Sarai has released the details of the next three Colette Patterns and oooh they are good! We have our order in, and will be getting them into the shop in a couple of weeks. Do you want to see them?! Firstly there is Lily. 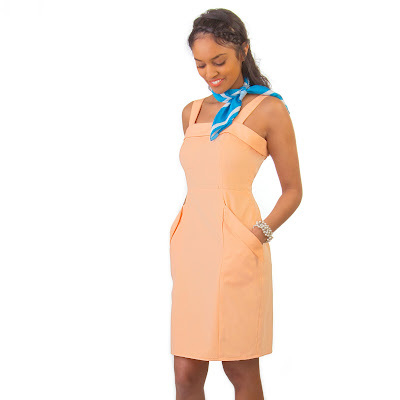 A splendid fitted sundress with neckline and pocket flap detail... just asking for all sorts of cleverness with contrast fabric. Hazel, my favourite, with this fantastic bodice panel, which looks brilliant with stripes... please note that both of these dresses have pockets, because we need pockets for our stuff, right?! And last, but not least, Iris. Shorts. How cool is that? Shorts with pockets! If you would like me to let you know when these come into stock, just send me a quick email. This mornings delivery had me positively skipping with excitement. Aneela Hoey's new 'A Walk in the Woods' is the first of a number of long anticipated ranges we are expecting in and, oh my, it does not disappoint. I struggled to narrow the collection down, but in the end settled on eleven of the fantastic prints. Foxlets is my favourite, but those dashes and circle are lovely too, and let's not forget the teeny mushrooms or Little Miss Red herself. I've made up a fat quarter bundle of the eleven prints for those of you who are committed. ﻿﻿﻿The other thing that I realised when this fabric arrived this morning was that it is actually a really good one for the basis of a boy quilt. Look at that selection above, all those greys, reds and blues scream boy! I reckon you could even sneak in the blue mushroom print without it becoming too girly. Anyway, if Aneela's last range is anything to go by, this one will sell quick, so don't miss out! Hello Folks! We're having a little de-clutter... clearing out some old in anticipation of the new. Firstly we have this most delicious Oliver+S interlock knit fabric. Available in six heavenly colours this luxurious, wide width fabric is a really lovely stable knit to work with. Trust me, I made some cute Madeline Bloomers from the green and it was a doddle (the pattern of which is free by the way, here). 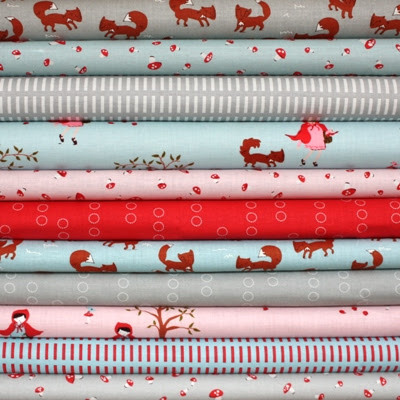 This fabric is down 30% from £18.00 to £12.60 per metre. You could try it for yourself with the Renfrew Top, Miz Mozelle or one of Megan's Maternity patterns. Or if you want to make something for your little one then what about the Tee for Two or Sleepover Pajamas? We're also putting into sale a whole lot of our Oliver+S patterns as we are eagerly awaiting our shipment of the new seasons offerings from Liesl. Some patterns are over 20% off!